Pentax has a newly announced camera due on the market in October. The K-r is designed to fit above the entry-level K-x and below the flagship K-7. A new improved model at the top of the range will be announced later. Here I will give a quick overview of the new camera. It remains to be seen which colour options will be available outside Japan. But let's move on to information of a little more photographic substance! 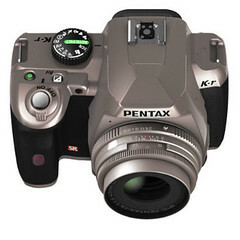 The K-r is very similar to the existing K-x, a camera I have owned for about a month. It has the same 12.4 megapixel CMOS sensor that has proven its worth in low light settings. There's 16-segment auto-exposure, a plethora of shooting modes, 720p video at 24fps and a Pentamirror viewfinder with 96% coverage. The K-r and K-x have standard Pentax features like backwards compatibility with all previous lenses, in-body image stabilisation and excellent image quality, with support for much customisation. The K-r is a smidgen bigger and heavier than the K-x but not so you would notice. In terms of improvements the K-r has the following features from the top-end K-7: AF point confirmation in viewfinder, an auto-focus assist beam and 3" LCD panel (921k pixels). All of these are excellent features. 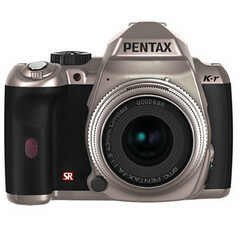 In several ways the K-r is better than any other Pentax body. It has ISO support from 100 to 25,600 in its extended mode (which works perfectly on the K-x). The frame rate is 6.0 for up to 25 shots... enough for any sports application. Furthermore there are additional custom image modes (including bleach bypass and reversal film) and all of them can now be applied to movies as well. Don't scoff at these, they are actually a lot of fun! The upgraded HDR (High Dynamic Range) function now has an auto align feature. It seems Pentax are trying to do away with the need for a computer entirely! The K-r sports two innovative features not found in any other camera, from any manufacturer. First, though the camera comes with a proprietary battery, an optional adapter allows the use of AA batteries as well. 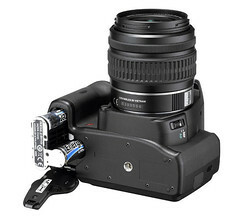 So this is the first SLR to allow you the choice of power source. Second, a feature called IrSimple provides high-speed infrared data transmission to other compatible devices. This allows very fast copying of your photos, even if only to share with friends. Apparently there is a built-in game (?!) that makes use of this feature. Here is the full spec in English from the Japanese site. In my next article I will follow-up with my thoughts on this model. Pictures of battery compartment sourced from optyczne.pl but assumed to be Pentax promo shots and used here as such. Follow-up Pentax K-r Viewpoint now available. I guess it depends on whether you are using an American "smidgen" or the Imperial "smidgen". The K-x weighs 515g (body only) and the K-r 544g. The K-x is 122.5 x 91.5 x 67.5mm versus the K-r 125 x 97 x 68mm. the sensor is new. Sony made a newer version with better iso abilities.